The Fair Labor Standards Act (FLSA) establishes a 40-hour work week for most U.S. workers by requiring that people working more than 40 hours a week are paid 1.5 times their rate of pay for their extra hours. However, the FLSA exempts some workers from these protections. In particular, salaried workers who make above a certain salary threshold and have the high-level duties of an executive, administrative, or professional employee are exempt. These should be workers who have enough bargaining power with their employer that they do not need overtime pay protections. The salary threshold is meant to protect salaried managers with little bargaining power from being forced to work unpaid overtime—for example, low- or modestly-compensated front-line supervisors at fast food restaurants who were never intended to be exempt. But, at $455 per week (the equivalent of $23,660 per year), the overtime threshold has been so eroded by inflation that it is now less than the poverty rate for a family of four. 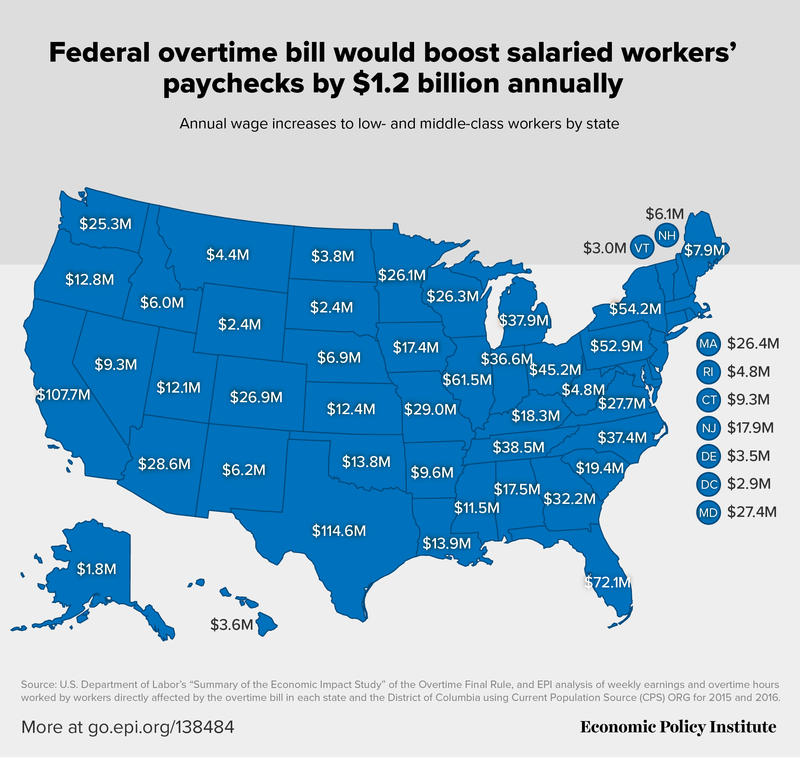 If the overtime rule had simply been adjusted for inflation since 1975, today the threshold would be well over $50,000. The Department of Labor published a new rule in 2016 that would have partially restored the threshold to $913 per week ($47,476 per year). However, business interests attacked this rule in the courts, and the Trump administration has strongly signaled that they intend to weaken this threshold. Pro-worker members of Congress are working on restoring fair overtime pay rights to working people: The Restoring Overtime Pay Act of 2017, introduced by Senators Sherrod Brown (D-Ohio) and Patty Murray (D-Wash.), and Reps. Mark Takano (D-Calif.) and Bobby Scott (D-Va.), would set the salary level for exemption to the same painstakingly researched standard identified in DOL’s 2016 rulemaking, and—as did the 2016 rule—require automatic updates every three years to prevent the threshold from falling so far behind again.